Did you or someone you love suffer an injury from a truck accident in Chicago, IL? This is a Chicago and Illinois based truck injury guide. Trucks are among the deadliest vehicles on the road, not only because they are so large that an impact can cause equally massive destruction, but also because drivers are often exhausted and under pressure to make deadlines from state to state. Under such conditions, truck accidents – and truck accident deaths – are almost inevitable. While accidents can occur anywhere, accidents in urban areas such as Chicago are more common because multiple interstate highways converge in the city, making traffic heavy. Despite traffic, many drivers of both trucks and passenger vehicles are still traveling at high rates of speed through the city and the surrounding suburbs. Surprisingly, the majority of accidents between commercial trucks and other drivers are not the fault of the semi drivers. In most cases, accidents are the fault of other drivers, who fail to realize that tractor-trailers – due to their sheer size – have numerous blind spots, making them more dangerous than traditional vehicles. As a rule of thumb, if you are traveling behind a tractor-trailer and you cannot see the driver’s side mirror, you are traveling too close, and are almost certainly in the driver’s blind spot. To be safe, stay back until you can see the mirror, so you know that the driver is able to see you. Not only are blind spots a problem for tractor-trailers, the time it takes for a truck to stop is also a safety issue. While cars can come to a stop fairly quickly if they see a road hazard, it takes an 18-wheeler about 40 percent more time to come to a complete stop than it would the smaller vehicle. Add adverse conditions such as rain or snow or a heavy trailer load, and that percentage can be even higher, and the results can be even more catastrophic. Imagine a tractor-trailer attempting to come to a stop on a snowy Illinois highway, carrying a heavy load. The trailer is likely to jackknife, and if vehicles are traveling in lanes alongside the truck, they could potentially be shoved off the road like balls in a pinball game. Construction zones can be equally hazardous, especially if drivers are reckless and attempt to pass truck drivers when conditions aren’t safe to do so, a situation that makes a truck accident with a car harder to avoid. Still, while the majority of accidents between trucks and other vehicles are usually the fault of other drivers, truck accident reports will show that truck drivers are still often at fault, and the reasons why should make you consider taking extra care when sharing the road with the super-sized vehicles. In July of 2017, one person was killed and three people were injured when a car was struck by a semi on the Tri-State Tollway in Worth, a suburb of Chicago. The driver of the car, a 36-year-old Georgia man, died at the scene after the car became “engulfed in flames,” according to police reports. The passengers in the car and the driver of the semi, which overturned in the accident, sustained non-life-threatening injuries. One of the most common reasons for such Chicago truck accidents is driver fatigue. Drivers have deadlines, and most spend long hours behind the wheel in order to reach their destinations on time. Legally, truck drivers are only allowed to drive a maximum of 11 hours and can only work 14 hours a day. (The extra time would be spent waiting for cargo to be loaded or unloaded.) After that, a driver is required to take at least 10 hours off before beginning another shift. While drivers are required to log the hours they spend behind the wheel, and face checks of their books at weigh stations, truck stops or traffic stops, drivers often carry two sets of logs in order to disguise how much time they are really on the road. Estimates suggest that as many as 40 percent of all crashes and 13 percent of fatalities involving tractor-trailers are the result of driver fatigue. A truck accident with car from fatigue can be dangerous and deadly. A lack of sleep can trigger numerous health problems, whether you’re a truck driver or not, but the issues are especially problematic when drivers are sharing the road with others. A slower response time, which could make a driver less able to avoid an accident. Impaired judgment and an increase in moodiness, which could lead to cases of road rage. In 2011, a jury awarded three separate truck accident settlements to three victims after a 40-ton semi-trailer carrying potatoes slammed into traffic that was stopped on Interstate 55, triggering a 10-vehicle collision. The three suits included two wrongful death suits and one personal injury suit and resulted in a $23.75 million settlement for the families of two men who were killed and one of the men who survived the crash, albeit with extensive injuries that included 17 broken bones. The driver was blamed for the accident because she had not only falsified her log books and was likely driving fatigued, but she also failed to slow down as she came upon stalled traffic, suggesting a slower response time associated with driver fatigue. If you are involved in a tractor-trailer accident, it’s important to gather evidence at the scene. That means taking photographs, taking down contact and insurance information for the driver, witnesses and the responding officers so an attorney can have access to as much information as possible to determine what happened and who was at fault. Make notes of the weather – ice and snow can be a factor regarding liability – and ask officers at the scene if they screened the driver for drugs or alcohol. Keep track of your medical records so that if the driver is found liable, you will receive the compensation you will need to cover your medical expenses. 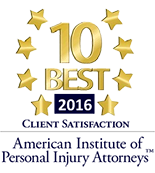 Because truck drivers work under both state and federal regulations, it’s important that if you’re in a truck accident in Chicago or the surrounding area that you contact a lawyer who knows not only federal regulations covering equipment inspection and maintenance, but also regulations in the state of Illinois. Did you know someone who experienced a truck accident today in Chicago? 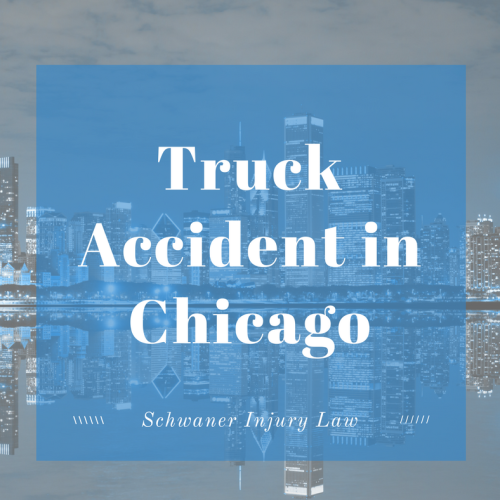 A good Chicago truck accident lawyer will make sure to gain access to the truck’s black box evidence – vital if a case goes to trial – and will ensure that the truck driver was adequately educated and trained before getting behind the wheel.